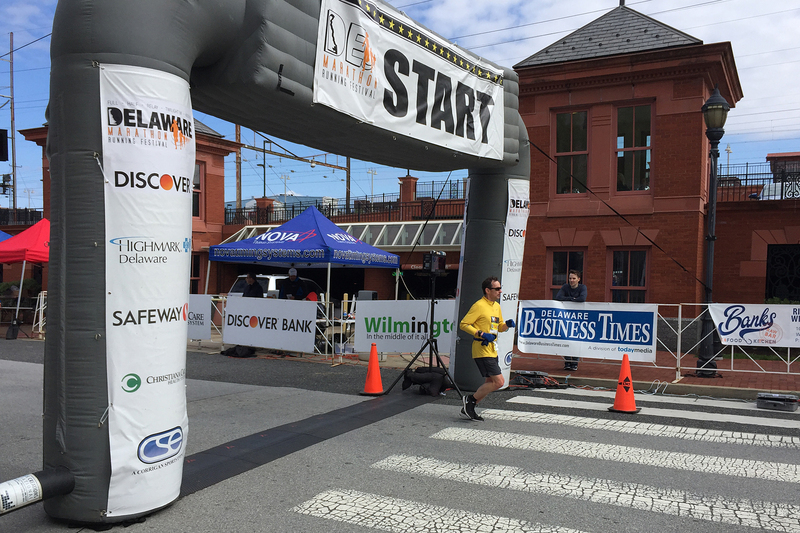 The 11-day-long cloud cover finally broke this morning, as several Creek Road Runners took place in either the Delaware Marathon, Delaware Half-Marathon, or 4-Person Relay at Tubman-Garrett Park in Wilmington. 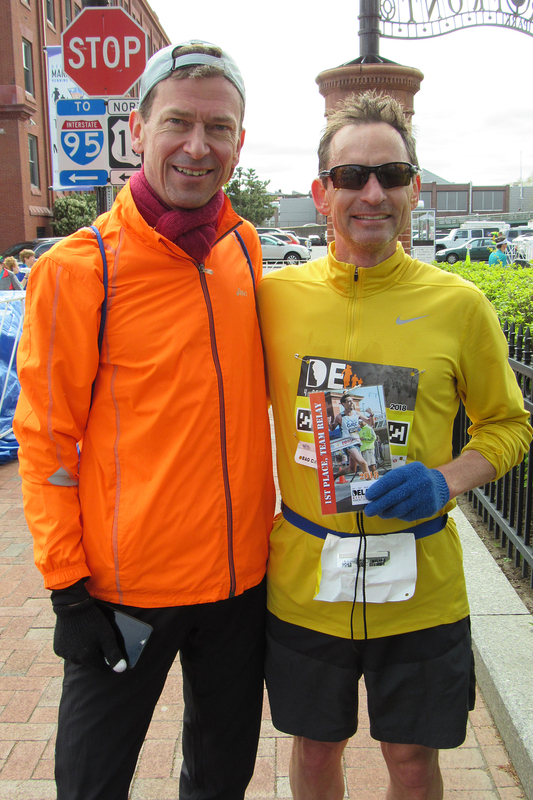 In the 26.2-mile race, CRR Andrew Weber finished 2nd in the 35-39 age group and 15th overall (out of 345 finishers), covering the marathon distance in a stellar 3:02:47 (under 7 minutes/mile)! Weber was the third Delaware resident to finish. CRR Barret Michalec finished 10th among the 35-39s and 46th overall in 3:27:19. 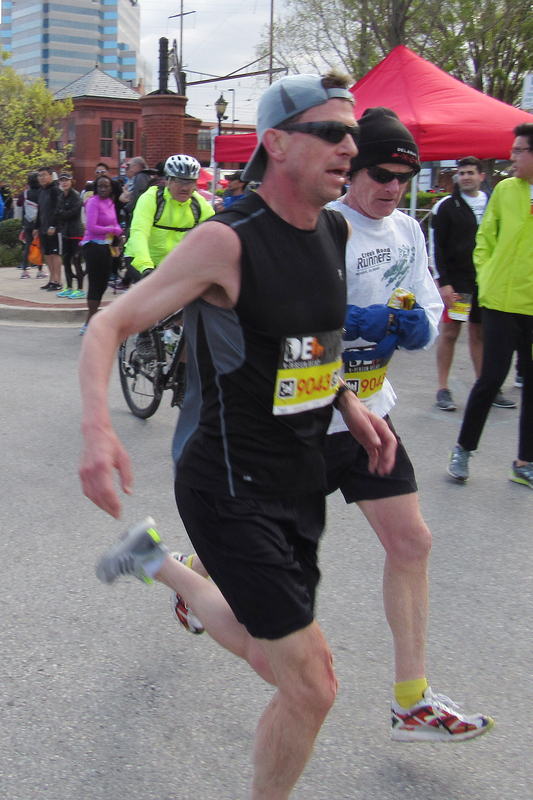 In the half-marathon, CRR Dan Weile took 3rd in the 40-44 age group and finished 41st overall (out of 892 finishers) in a fast 1:35:04. 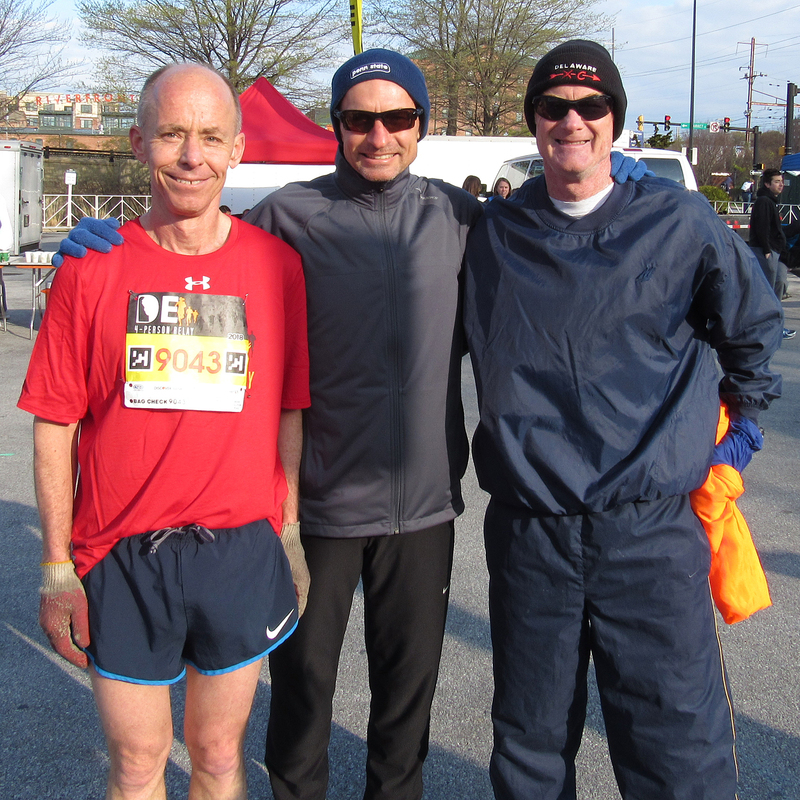 CRR Tripp Shenton finished 2nd among his peers in the 55-59 age group and 83rd overall in 1:43:25. 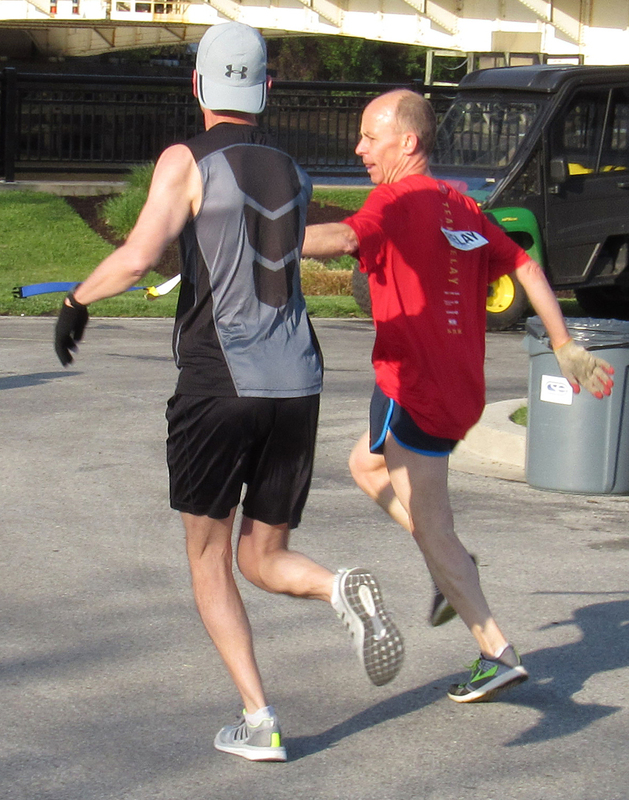 Bill Rose (right) finishes and hands off the timing belt to Bill Farquhar for the anchor leg. 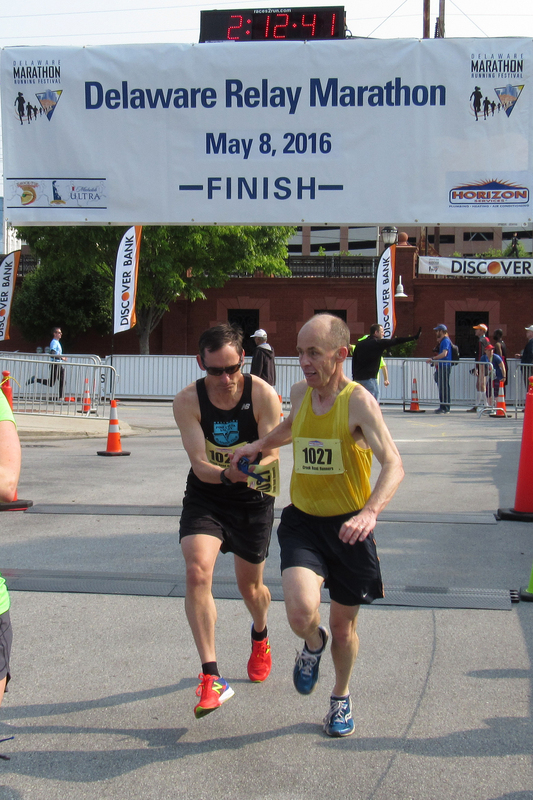 The Creek Road Runners team won the Senior Team division and placed 5th overall (out of 99 teams) in the 4-person relay (four 6.55-mile legs), covering the 26.2-mile distance in 2:53:49. CRR Keith Crispin got the team off to a good start in 42:33; CRR Mark Deshon, the most senior member of the group, turned in a respectable 46:47; CRR Bill Rose ran a 43:17—pretty close to a team-average time; and CRR Bill Farquhar blasted a fast 41:09 anchor leg. 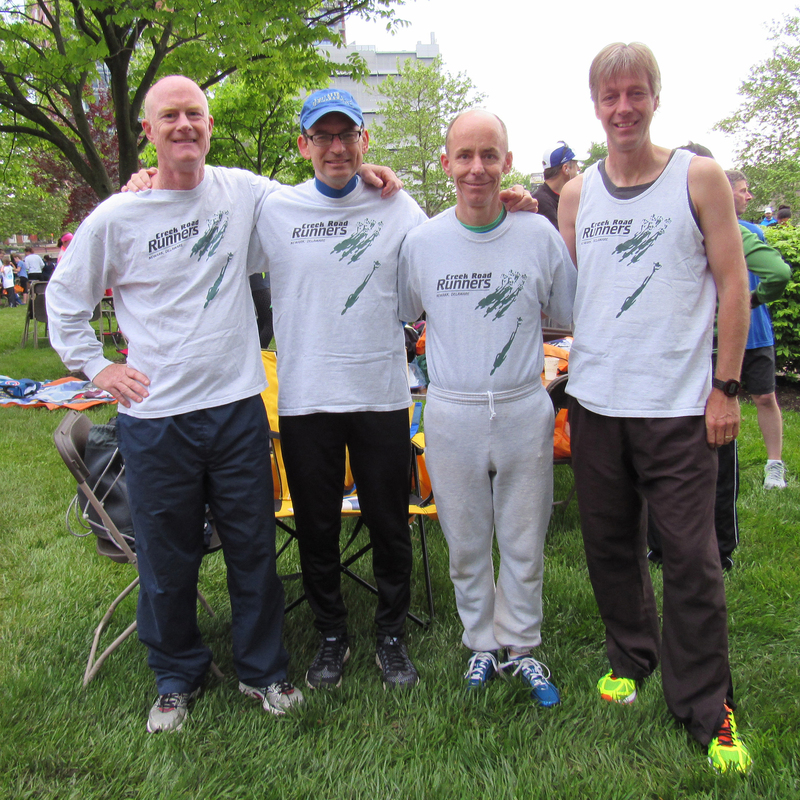 The team missed out on a fourth-place overall finish by a mere 16 seconds. The average age of the four runners was 53, brought down quite a bit by the relative youngsters Crispin and Farquhar. 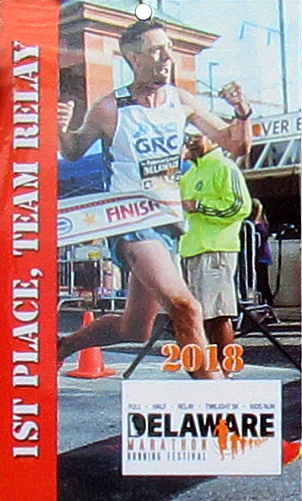 On Saturday in the Delaware Marathon Running Festival 5K, CRR Diane Kukich won the 60-69 age group, coming in 15th overall (out of 115 finishers) in 23:55. This was Kukich’s best 5K time in five years.